This top is one of the trendier pieces that I have in my wardrobe right now and I'm really loving it. There is a lot going on--the rouched sleeves at the wrist, the high neckline with pearl button closure, the ruffles, but somehow it all works together and I think it looks really sophisticated. 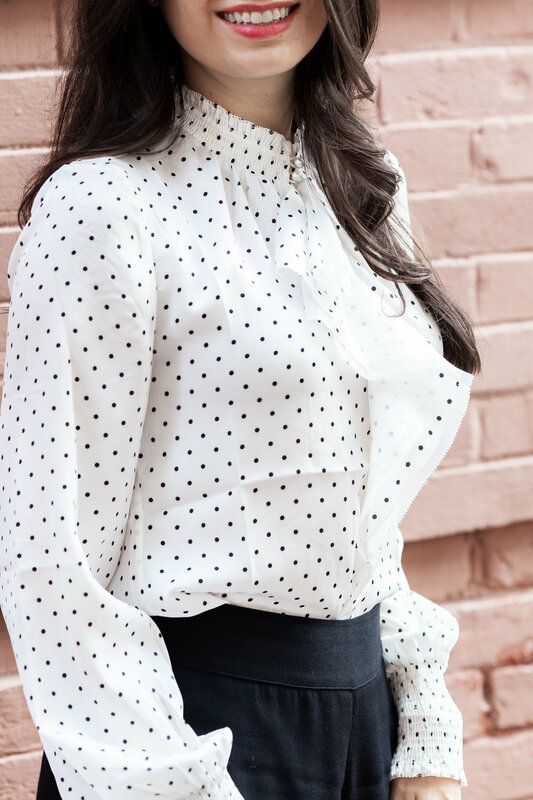 This top works really well with high-waist black bottoms, whether you pair with pants or a skirt, (as you can see, I wore culottes), but this top could also easily work with colored pants or skirts, because its neutral (black & white). I recommend a high-waist because I think this top looks really good tucked in and I tend to think things look better (at least on me) tucked in if the waist is higher on the pants or skirt. I got this top from White House Black Market, and I also linked to it below. The culottes are a pair that I bought from Brass awhile ago. What I like about them is that they're a thinner fabric, so while not really practical when it's colder, they're great to wear in warmer months or when transitioning between seasons. Since these aren't in stock anymore I tried to find similar culottes that are made of thinner fabric. I think the ones I linked from Express below fit the bill, but they are in limited styles. Another great option that I linked are the MM. Lafleur culottes, which are more expensive, but of high quality. I think the fabric on those is a bit thicker. 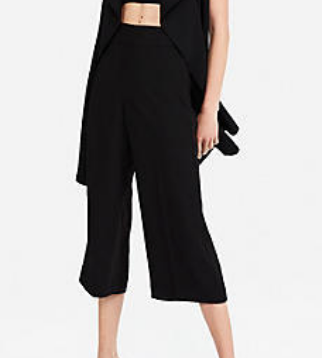 Then finally, Ann Taylor has a nice pair of black culottes in stock right now (or at least at the time of this posting) which are very nice. I've tried them on. They are a thicker fabric, so they don't fall the same way as these (not as flowy) but they are nice. I have linked those below as well. And then, finally, we get to the shoes. I tried to find similar D'Orsay heels like ones I am wearing, but this style is astoundingly tricky to find. I do not know why. I linked similar heels below, but this outfit would look with any black pump or dress shoe that you already have in your closet.